Agile Coach | Cape Project Management, Inc.
Honolulu has a thriving startup community. I decided to present on this topic after attending the kickoff of the extremely popular start-up event, Honolulu Startup Weekend. While listening to the pitches, I realized that these potential new companies were ripe for some Agile basics. Many of them were already very familiar with Lean Startup and customer driven business development, but very few were familiar with the Agile techniques designed to manage day-to-day projects or business. First, "To live a more balanced existence, you have to recognize that not doing everything that comes along is okay. There's no need to overextend yourself. All it takes is realizing that it's all right to say no when necessary and then focus on your highest priorities." This is perfectly aligned with the Agile Manifesto principle, "Our highest priority is to satisfy the customer through early and continuous delivery of valuable software." Quadrant 1 is for important activities you could not have foreseen, and others that you left until it was almost too late. Plan for these. Quadrant 2 is for important activities that help you achieve your personal and professional goals, and complete important work. Focus here. Quadrant 3 is for time-sensitive distractions. They are not really important, but someone wants it now. Learn to say no. Quadrant 4 is for activities that are just a distraction. Avoid them if possible. The intent of this matrix is to get people to focus on daily activities and plan their time within Quadrant 2. At the time of publication (1989), the most common technique for managing your time spent on important activities was to capture them in your calendar book. This was before phone apps or even the use of Outlook calendars. They were documented in those heavy DayTimers calendars that people carried everywhere. Covey's training courses suggested that you block time in your calendar to focus on important tasks and limit the time you spend on urgent tasks. For those of you familiar with Agile techniques, it is easy to see how these techniques can be applied to many different situations other than software project management. I also believe that there are very few new ideas in Agile since these effective management techniques have been around for many decades and are just now being embraced within traditional project management. If Stephen Covey was a software developer, he would have made a great Agile coach. 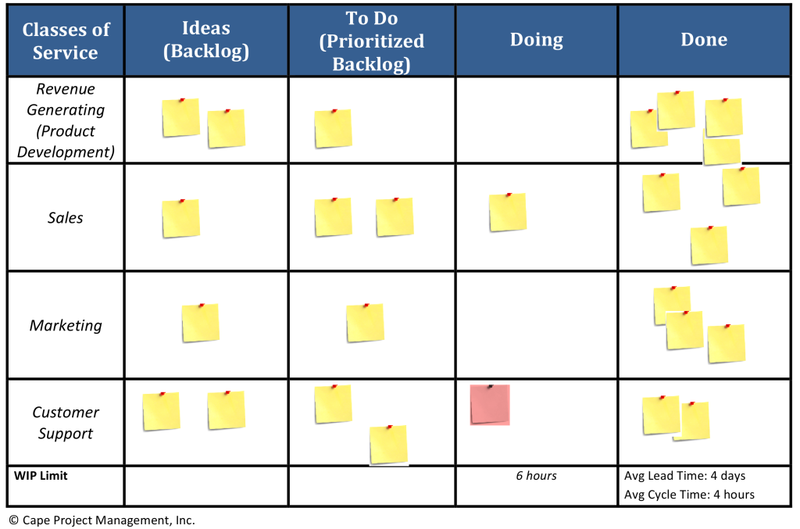 For more information Kanban, check out my blog post or listen to my Introduction to Kanban self-study training. Dan is a lifelong project manager and trainer with extensive experience in managing Agile software development projects. Though the role of the professional project manager is changing dramatically through these approaches, Dan coaches organizations on how to transition teams and organizations to Agile. Dan holds a Bachelor of Science majoring in Industrial Engineering from the University of Massachusetts, Amherst and is a Certified Project Management Professional, Professional Scrum Master, PMI Agile Certified Practitioner and Certified Scrum Professional.